I used to pretend to be asleep on the Metra, until they implemented the quiet car. In all seriousness, it is a wise saying, and sad as well. Yes it is. No matter what, it is always an act of escape, denial, or purposeful shutting out of something. You have seen me on a Saturday morning?! This one goes right to the top today, Beth. Thank you for the kick start. I am only the sharer but I thought it was very powerful and meaningful. It might fall on deaf ears though. A wise saying that can be hard to take. Why would anyone choose to fake being asleep? Maybe because dealing with a reality they don’t want is so hard. 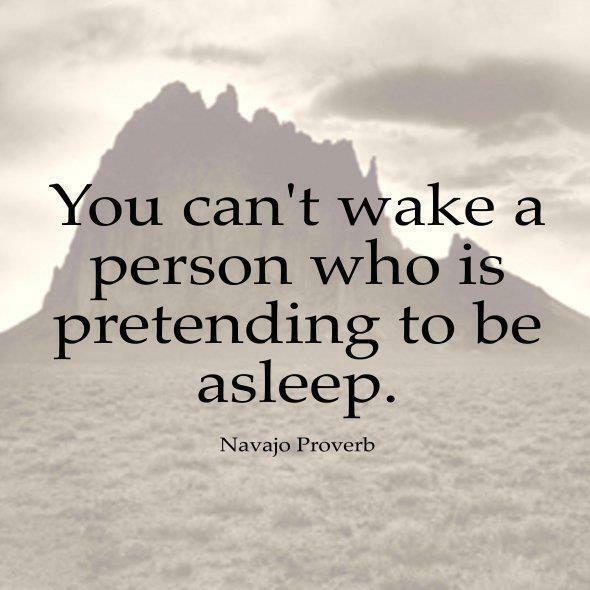 oh, my god…I adore this…on so many levels…on the lowest level, I am married to somebody who does this…pretends to be asleep…and on another level, the entire world seems to be engaging in this deception or escape mechanism at the moment…. Simply true. Depending on why they’re faking….I might not have the heart to fake wake them. And let them rest.